Due to the lack of protection a motorcycle rider has compared to a car or truck driver, severe injuries and fatalities are common when involved in a motorcycle crash. 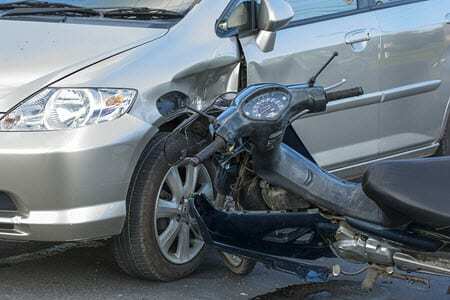 The size differences between the vehicles often result in severe damages to the motorcyclist, including loss of limbs, spinal damage, disfigurements, traumatic brain injury (TBI), and death. Nobody anticipates having a motorcycle crash and therefore does not plan for the extreme medical expenses, losses, and damages that may be a result from someone else’s negligence. As a result, it is crucial to contact the motorcycle accident lawyers of Lowenthal & Abrams if you or a loved one have been hurt, so we can help you and your family seek the compensation to which you are entitled. Wearing a helmet is important when riding a bike. Motorcycle accidents are more likely to be deadly than car crashes. Motorcycle riders are more likely to die in a crash than are drivers in cars or trucks. There are a number of reasons for this, but most of the time, the rider dies due to the lack of protection surrounding him. If a motorcyclist hits something, he will go flying and crash into the road. His likelihood of a serious injury is made worse if he fails to wear protective gear, especially a helmet. Sometimes, motorcycle accidents occur because of the behavior of car and truck drivers. Other times, the accidents happen due to unsafe conduct on the part of the riders themselves. 56% of motorcycle accidents leading to death involve other vehicles. Car and truck drivers are not aware of motorcycles due to their smaller size. This comes down to a visibility problem or a simple failure to pay attention on the part of the car’s driver. The most likely time for a car to hit a motorcycle is when the car is making a left-hand turn. 42% of car/motorcycle accidents occur at this time. Normally, the auto will hit the motorcycle when the bike is traveling straight through an intersection or trying to pass the car. Most of the time, if a motorcyclist is involved in this kind of crash, the car will be found at fault, but there are some exceptions. When motorcycles collide with cars, they normally hit the car in front of them. 7% of riders were hit in the rear by the vehicle behind them. If a rider collides with a car from behind, it is almost always the bike’s fault and the rider will be liable to the car’s driver and passengers for any property damage or injuries. Lane splitting causes a lot of collisions between motorcycles and other vehicles. Lane splitting is when the rider drives his bike in the middle of two lanes of slowly moving or stopped traffic. This is common behavior on major expressways like the Schuylkill Expressway or the Pennsylvania Turnpike. Lane splitting is illegal in Pennsylvania. Most of the time, if a bike gets in an accident while splitting lanes, it will be the rider’s fault. But there are circumstances when the driver of the other vehicle will bear some if not all responsibility as well. Speeding is a common cause of any kind of accident, including motorcycle crashes. When a rider speeds it is very difficult for him to respond quickly enough to stop. This kind of behavior is especially common on high performance bikes. The death rate on high performance bikes and sports bikes is higher than that of regular motorcycles. Lane changes by cars cause accidents with bikes as do lane changes by motorcycles. Especially when a car is changing from the right lane to the left. If the bike is in the driver’s blind spot, he may not see the rider and can sideswipe the bike, sending the rider and bike tumbling. Problems with the road are frequently more dangerous to motorcycles than to other vehicles. Since bikes are on two wheels and not as stable as cars, an oil slick, a bad pothole, a dead animal on the road, all of these things are much more likely to cause the rider to lose control of his bike. In some cases, if a road is not properly maintained, compensation from the municipality might be available. Fixed objects on the road are very dangerous for motorcycle riders. 25% of motorcyclist deaths are due to collisions with fixed objects. Cars and trucks need to watch out for bikes. They are harder to see so everyone needs to pay close attention. There are a number of ways to reduce the chance of being in an accident while riding a motorcycle or sharing the road with motorcycles. As a car or truck driver, the number one way to avoid a crash with a bike is to be aware. Just remember that motorcycles are on the road. Don’t tailgate bikes. If the rider should lose control, you could easily run him over. If you get too close, you could cause the rider to lose control and crash. In addition, if you rear end a bike rider, you could cause him serious harm or even kill him. If you are a motorcycle rider, wear the correct safety gear. In Pennsylvania, helmets are not legally required for adult riders, but it is still safer to wear one. It is easy to suffer a serious or deadly brain injury if you are in an accident. Brain injuries, if you survive them, are life changing experiences. Even a small one. Don’t drink and ride. Anything that interferes with your ability to concentrate while riding a bike is a serious problem. Don’t speed. Bikes are already difficult to control. If you add in speeding and come up on an unexpected object in the road, you could easily crash. You are also more likely to lose control of a speeding bike. Get the right training. Professional training can be a huge help in learning how to ride properly. Most bike accidents happen to riders who did not obtain professional training. Don’t split lanes. It is no doubt tempting to split lanes or travel around backed up traffic. But chances that you will be in an accident are substantially increased. Not to mention, this is illegal and you could get pulled over by a police officer. Ride a bike you can handle. When you first start riding, make sure you are comfortable with your bike. Work your way up to more powerful and faster bikes are you are able to do so. Give us a call if you were injured in a crash. We’ll work to get you the right settlement or we’ll take your case to trial. If you are in a crash, get yourself checked out at the doctor or hospital as soon as possible. You will want to watch for head injuries which sometimes don’t show up for days or weeks. Make sure you obey the law as far as exchanging insurance and contact information, assuming you are in the physical shape to do so. If you not at fault for the accident and you are injured, give a call to one of our Pennsylvania motorcycle accident attorneys. Our number is 888-979-7298. We will help you seek the right compensation for your injuries.